Why Abby Wambach Doesn't Want To Be Known 'Just As A Soccer Player' Wambach scored 184 goals, more than any other man or woman in the history of international soccer. Still, she knew that someday that identity would end — and "what then?" Her new memoir is Forward. 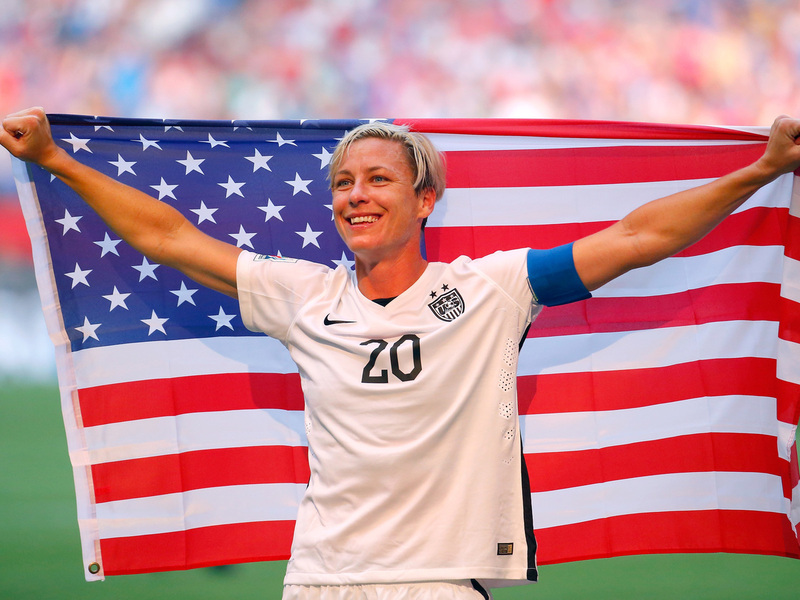 Abby Wambach celebrates the U.S. team's victory against Japan in the FIFA Women's World Cup on July 5, 2015. 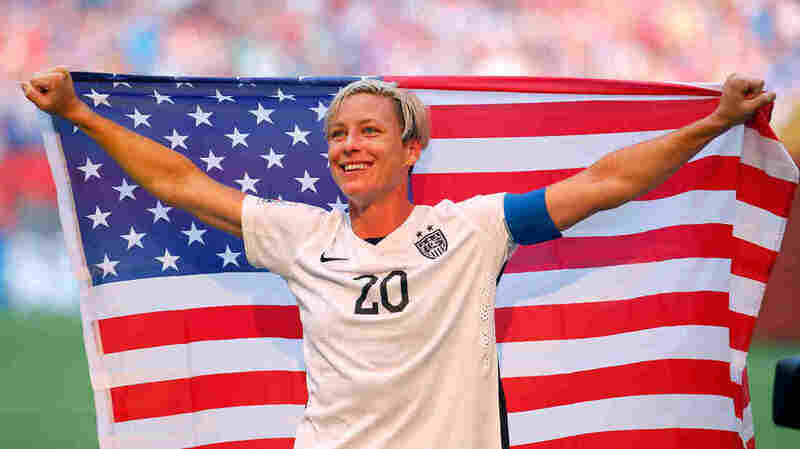 Over the course of her career, soccer star Abby Wambach scored 184 goals — more than any other man or woman in the history of international soccer. She won two Olympic gold medals and was named the 2012 FIFA World Player of the Year before retiring from the sport in 2015. And yet, she says she never wanted to be known "just as a soccer player." "I knew at some point that that identity would come to an end, and if I stripped that identity away, what then? Who am I then?" Wambach tells Fresh Air's Terry Gross. "That's what [these] last few months have really been about for me, is emerging into the person who I really am." 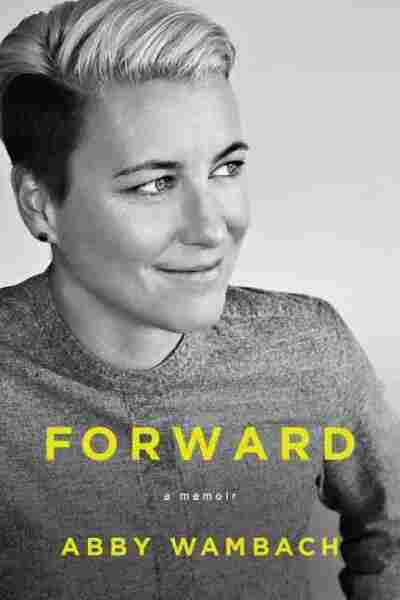 Though Wambach acknowledges that her "soccer player" identity will always be part of her life, her new memoir, Forward, paints a broader portrait. In it, she writes about growing up as the youngest of seven children, her romantic relationships and her struggles with alcohol and prescription drugs. Looking ahead, Wambach says that women today have an obligation to set a good example for the generations to come. "We need to have women in more powerful positions that are making decisions, so when that 10-year-old girl is looking up and wondering, What can I do and what do I want to be when I get older? She has the opportunity to do and be whatever she wants," she says. "And then, more importantly, ... I want that 10-year-old boy that she goes to school with to be able to look at her and to be able to say, 'She can do whatever she wants.' "
When I was younger, the validation definitely was what drove me into the sport, and as I grew older, to be able to play professionally and to have the lifestyle that I had for so long, I was able to fall in love with parts of the game. I don't know if I found soccer or if soccer found me. Especially because when I was younger, I was doing it in a lot of ways because I wanted the attention of my mom and dad. Being the youngest of seven, it's hard when you're young and you really just want that love and affection from your parents, and they did the best that they could. I never saw any goal hit the back of the net. There's something that happened to me — I don't know what it is, I don't know if it's an actual physiological thing or just a psychological thing — but anytime I struck a ball with my foot or my head that went in the goal, I actually never saw the ball hit the back of the net. ... My screen went black, either [I was] too elated or I was too excited about scoring that I lost my screen for a ... brief second. "Little did we know that it would go viral," Wambach says of the now-iconic image of her kissing Sarah Huffman at the 2015 World Cup. On why coming out is "so 2010"
I'm not the person that's gonna stand on top of a mountain and be like, "I'm gay, hear me roar!" Because I actually don't believe that my sexuality matters to myself, it doesn't change my life in any way, if that makes sense. I think that nowadays coming out and being like, "Oh yeah I'm coming out of this closet," I think that's so 2010. I think it actually speaks more volumes for people to just be who they are rather than having to explain who they are. I ran to the stands and I wanted to go over and see my family and Sarah was there, my wife at the time [they have announced they are getting divorced] and I look up to her and we hug and she kind of pulls her head away and she goes, "Kiss me!" And I was like, "Oh? We're doing that here? Now? Got it." So it was really sweet. The funnier part of that story that I don't write about in my book is one of our friends actually took a picture of it in the stands, like "Oh my God, what a moment, I can't wait, I'm so happy I got this moment captured on my phone!" and they sent it to Sarah and she was like, "Oh my God, I'm so glad that you caught this!" Little did we know that it would go viral and be kind of this epic — this kiss that goes down in the history — so I'm really actually proud of it. I'm proud of her for forcing me into it. God bless her soul, literally, she's a wonderful woman, and brought me so much joy and so much love throughout my life, but this was a hard thing for her to understand, because of her faith, and I get it. I want so much for her to accept me. I pleaded in so many different ways with her, but because of her faith it has taken her a long time to understand this whole process, this whole idea — that "this is not a choice, this is who I am" conversation. I think over the years she understands it more, but over the years I've also accepted her and her faith more. Getting so publicly shamed and humiliated was maybe the only thing that would've woken me up. I've struggled for the last bunch of years with my career, the pending retirement, so there was a lot of things going on for me at one time that kind of bubbled over and exploded kind of all at the same time, which led me to kind of spin out of control after my retirement, and it's kind of how I found myself in jail April 2nd. ... I got arrested, got a DUI, which at this point now, in hindsight was the best thing that could've ever happened to me. Getting so publicly shamed and humiliated was maybe the only thing that would've woken me up.